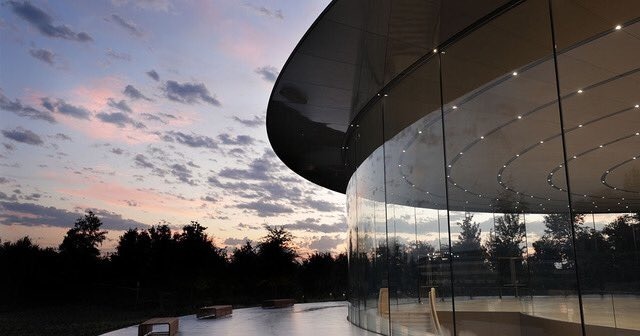 The Steve Jobs Theater — located at Apple Park in Cupertino — has picked up a 2018 "Structural Artistry" award from the U.K.-based Institute of Structural Engineers, given to buildings which have been "transformed by the vision and skill of the structural engineer into something exceptional." The theater's above-ground pavilion is "the largest structure in the world solely supported by glass," the Institute said. Although made of carbon fiber, the roof still weighs some 80 tons. Each glass panel holding it up consists of just four layers of 12-millimeter thick plies, nevertheless built to cope with California's dangerous seismic activity. Electrical systems, sprinkler pipes, and other needed infrastructure items are made invisible by hiding them in 30-millimeter joints between the panels. The firm responsible for the building's structural design — Eckersley O'Callaghan & Arup — is said to have worked in a "close relationship" with Apple. 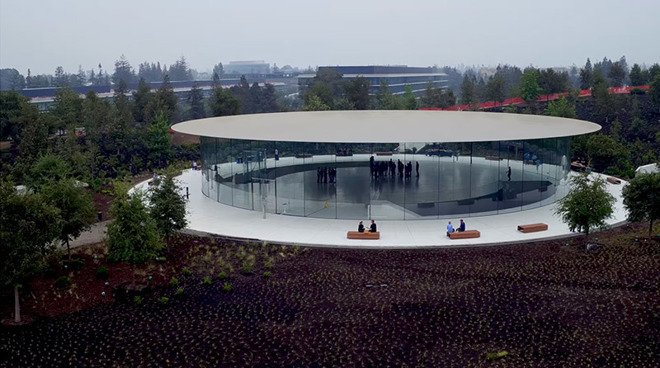 Apple is known to take a hands-on approach to much of its corporate and retail architecture, and in fact Jobs himself is credited with many of the decisions for Apple Park, though he died in 2011 before construction could start. All-glass surfaces in particular have become a recurring theme. The main ring at Apple Park is wrapped in curved-glass windows, and even uses floor-to-ceiling glass in its interior office space. Distracted workers have reportedly walked straight into walls. With exceptions like Apple Champs-Elysees, the company has also graced many of its retail stores will all-glass facades. This has actually created security problems, since robbers will sometimes ram a vehicle through the glass, scoop up as many devices as possible, then flee within a matter of minutes.